Wonder welcoming us with a cup of tea. “Good afternoon! Welcome to Majeka House! My name is Wonder. Can I help you with your bags?” I stopped in my tracks. “Sorry, did you say your name is Wonder?”, I asked. “Yes, it is”, Wonder replied with a big smile. I didn’t know it then but this would be the first of several wonders during my stay at the Majeka House! 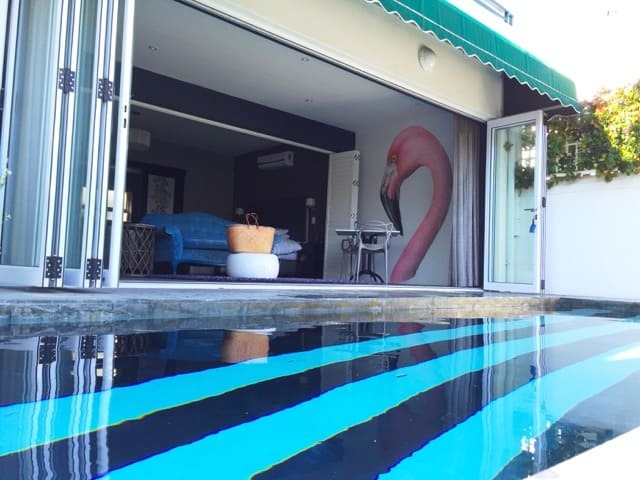 The Majeka House is a luxurious boutique hotel situated in the outskirts of Stellenbosch, a lively university town in the heart of the Cape Winelands and about a 40-minute drive east of Cape Town, South Africa. The hotel is a quick ten-minute drive from the centre of Stellenbosch and makes for a great base from which to explore the winelands due to its proximity to major trunk roads in the region. Majeka House features individually-decorated rooms, each with a private balcony or terrace whilst some rooms have an inviting pool right at their doorstep. Majeka House (image courtesy of Majeka House). The second ‘wonder’ I encountered at Majeka House was my room! It was simply gorgeous! Everything about it felt luxurious, from the fluffy bathrobes (the softest I’ve ever experienced) to the plush furniture, the incredibly comfortable bed, the interior – a cool mix of understated elegance and funky elements, and last but not least… the stunning pool right outside the doors that swung open onto the terrace! The amenities in the room were excellent; I especially loved the Lavazza coffee machine and the well-stocked minibar. One of the fabulous rooms at Majeka House (image courtesy of Majeka House). The pool outside my room. That evening, I was introduced to a few more wonders! I kicked off the evening with a cocktail at the beautiful MLounge (a must-visit for pre-dinner cocktails! ), before heading to the Makaron Restaurant for dinner. I’d heard many great stories about this restaurant, voted one of the top-20 restaurants in South Africa, so I was excited to finally have the opportunity to dine here. The friendly waiter brought me the menu as the sommelier showed up. I requested a Pinotage and she recommended one from the Longridge Estate. Her recommendation was superb: the Longridge Pinotage was full-bodied with gorgeous hints of berries, plums, roasted almonds and chocolate. Dinner was an elegant affair, with fresh, seasonal ingredients used to create delicious, beautifully-presented dishes. It wasn’t hard to see why Makaron ranks among the top establishments in the country! The food at Makaron was simply superb! After a morning swim in my (semi)private pool, I headed to the Makaron Restaurant for breakfast. I gasped as I entered the restaurant. The breakfast spread looked incredible! The breakfast spread at Majeka House. There was a separate menu on the table and I ordered the Eggs Benedict. As I waited for the eggs to arrive, I treated myself to fresh fruits and a few fruit/veggie shots (these are freshly-blended by the kitchen staff and served in small bottles). The eggs were fabulous: sitting on a perfectly-toasted muffin and slices of smoked salmon and spinach, and topped with a rich Hollandaise sauce. Those eggs were a great start to the day! Majeka House had one more ‘wonder’ in store for me: the Majeka Spa! The elaborate spa features a large indoor pool, steamroom, jacuzzi and sauna, and offers a wide variety of treatments from relaxing massages to facials, hot stone therapy, body wraps and scrubs, and the intriguing Himalayan Crystal Salt Bed! I settled for a terrific aromatherapy massage and scrub that left me feeling pretty light on my feet! 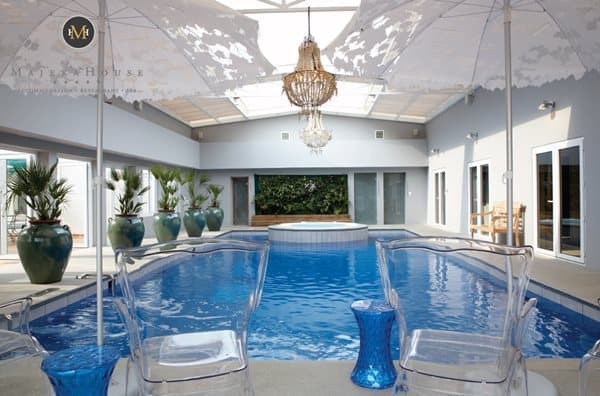 The Majeka Spa pool (image courtesy of Majeka House). I was sad to leave Majeka House; I wished I could’ve stayed longer to have another dinner, another breakfast, another cocktail, another spa treatment and spend just one more day at the lovely pool outside my room, but alas… I hope to return one day and experience the ‘wonders’ of Majeka House once again! Read about things to do in Stellenbosch. Note: I was hosted by Stellenbosch Wines Routes at Majeka House. However, all opinions mentioned above are mine, and mine only. If you stayed at Majeka House, you’ll wholeheartedly agree! You can book a stay at this hotel via the two links in the post: in the second paragraph and in the last sentence at the bottom. Hope this helps. I’m sure you’ll have an amazing stay at Majeka House. How can I book this hotel? No links on your site?